As you may know, I have written a SketchUp extension that lets you follow SketchUp news (official and inofficial) and discussions right within SketchUp. You can install it from the Extension Warehouse or the SketchUcation PluginStore and then afterwards access it anytime you like from SketchUp’s Help menu. Because Yahoo recently discontinued its Pipes technology, I had to fix this extension’s discussions section anyways. This gave me a chance to redesign the interface completely in a darker, more elegant tone. You can see the result in the image above. If you have already installed this extension, then there’s nothing you need to update. Just start it from the Help menu and the new design will be there. 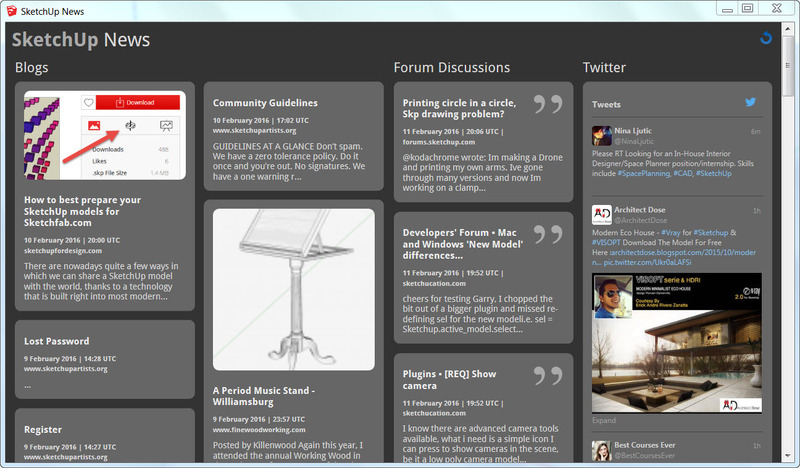 Also, if you rather not install anything, then you can read these news on my sketchupfordesign.com website as well. I am hoping this will be a useful addition to your workflow. Let me know if you have any comments or suggestions.